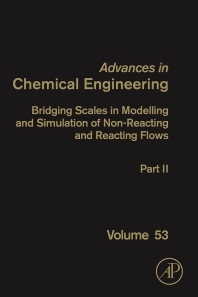 Bridging Scales in Modelling and Simulation of Reacting Flows, Part B, Volume 53, presents key methods used to bridge scales in the simulation of reacting multiphase flows. It looks at the different aspects of such flows (transport phenomena, reactions) and includes illustrations of the methods on a variety of applications, along with the contribution of key groups in the field. Sections in this new release include multi-scale methods for fluidized bed reactors, a discussion of advances in coarse-grained discrete particle methods with industrial applications, and spatial filtering for scale bridging and its application to transport in dense bidisperse particle beds, and more. Juray De Wilde received his Ph.D in Chemical Engineering from the Ghent University, Belgium, in 2001. He did post-doctoral work at the Ghent University and was post-doc research associate at the Chemical Engineering Department of Princeton University, NJ. In 2005 he became associate professor of Chemical Engineering at the Université catholique de Louvain, Belgium, where he received his tenure in 2008 and became professor in 2012. Since 2011 he is the head of the Materials and Process Engineering Unit (IMAP) and since 2015 the vice-president of the doctoral school for process engineering for the Walloon Region of Belgium (GEPROC). In 2015 he was visiting professor at the University of Colorado (Boulder) and since 2015 he is visiting faculty at the National Energy Technology Laboratory (NETL) of the US Department of Energy through the Oak Ridge Institute for Science and Education (ORISE) of the Oak Ridge Associated Universities (ORAU). Dr. De Wilde published more than 40 papers in international journals, served as a member of various scientific committees and collaborated with numerous companies via research projects. His research interests and expertise include dynamic methods for catalytic kinetics, the modeling and simulation of single- and multiphase reactors, and process intensification, in particular for fixed and fluidized bed processes.